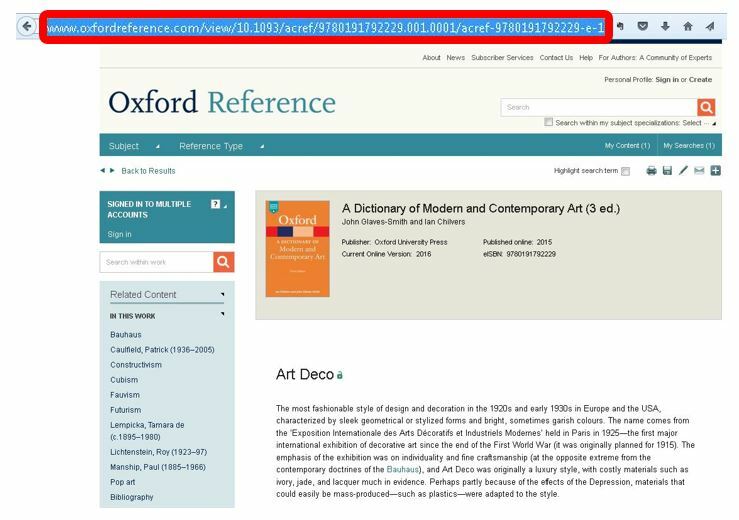 Durable links, otherwise also known as stable, direct, or persistent links, are very useful tools for off-campus sharing and bookmarking of e-journal articles, e-books, electronic reference materials, media objects, and other e-resources subscribed to by UNB Libraries. Durable links directly connect you to specific UNB Libraries’ holdings that require proxy authentication—a verification of your UNB or STU affiliation—by the publisher or vendor of electronic content. Since durable links include the UNB and STU proxy information, they allow you to easily verify your university affiliation. 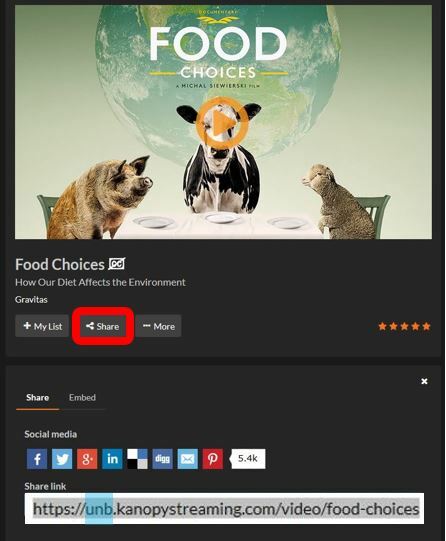 This is why simply copying and pasting links from your browser will typically fail when sharing or bookmarking subscription library e-resources. 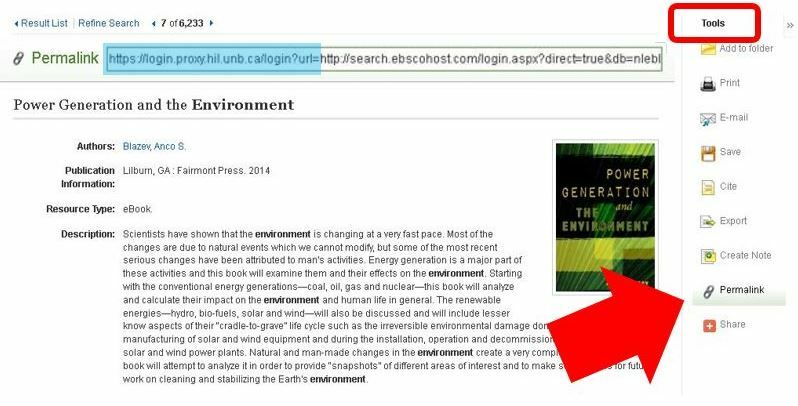 Here are examples of how to set up durable links (and bookmarks) to subscription library e-resources. Locate e-books by searching in UNB WorldCat and use the limiters on the right-hand side of the results page to limit your results to e-books. Alternatively, go to the Resources tab located at the top of the library's home page and select e-books from a drop-down menu. Choose from a list of e-book providers, such as EBSCO, and search for your desired title. Select "permalink" from the Tools section. Power Generation and the Environment. Bookmark and share durable links to dictionary or encyclopedia entries. Use the link to Reference Materials from UNB Libraries' homepage to access UNB Libraries’ online reference resources. Once you have found a suitable definition or entry, copy the URL for that term. 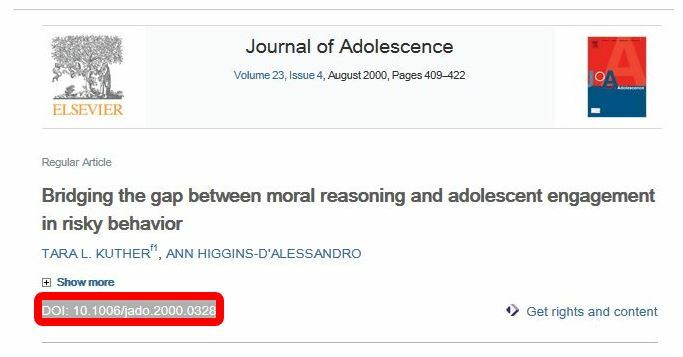 Bookmark and share durable links to e-journal articles. Since the complete URL must include the prefix, you have to add the proxy prefix yourself, in the case where the vendor does not provide it. Here is an example where the vendor does not provide the proxy prefix. Here is another example where the vendor does not provide the proxy prefix. Bookmark and share durable links to works of visual art, music, sound, and more. These can be found through various online resources, including ARTstor and Kanopy. For some resources, you will need to create an account for yourself in order to view and use durable URLs. 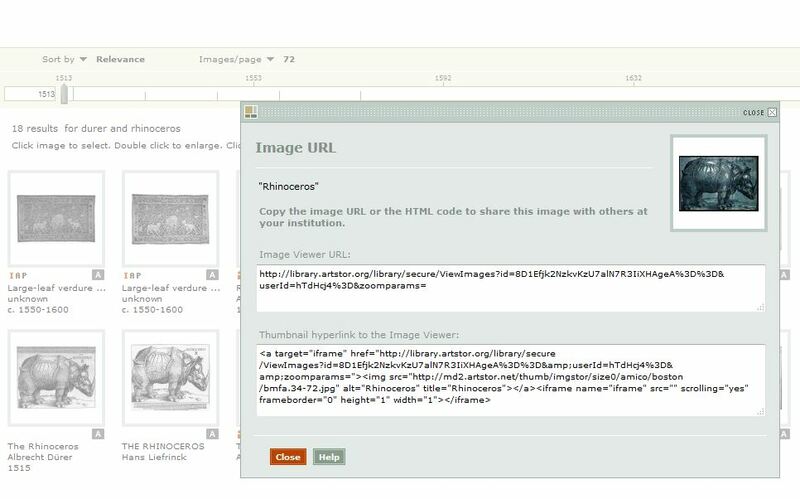 For instance, once you have created an account in ARTstor, you can right-click on an image and view an image URL. You can also share folders of images with your classmates. Select the images that you want to share from your search results. From the Organize menu along the top of the screen, choose the Save selected images to sub-menu and save your images to a New image group. Name your folder and click the Save & Open button. Kanopy, one of UNB Libraries' film streaming subscriptions, permits easy sharing of URLs, by clicking on the Share link in each record. Note, however, that the authentication built into the URL looks different from the above proxy prefix, but it works in the same way by allowing the user to easily verify her university affiliation. Feel free to contact us with any questions. We would love to help you.